Beat the February blues by enjoying a vegetarian feast using Easy Bean meals - delicious one-pot bean-based meals which can be eaten on their own or mixed with other ingredients to make a delicious spread. Easy Bean pots are based on classic dishes from around the world and are now more available than ever in stores across the UK. New Mexican Chilli: Red beans with sweet peppers, tomatoes and spiked with the jalapeño chilli. Serve in tortillas with sour cream and avocado. Moroccan Tagine: Pictured above. Slow-cooked chickpeas, Mediterranean vegetables, apricots and spices. 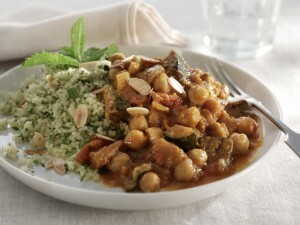 A tasty treat served on couscous and topped with toasted flaked almonds and a sprig of mint. Indian Sambar: Toor Dhal peas simmered slowly with coconut and tamarind juice plus chunky vegetables and mustard seeds.